Pizza can be much more interesting than the typical American tomato sauce/meat/cheese affair, and it’s pretty easy to make yourself, either with your own homemade crust or with the help of ready-made dough or crusts. My friend Amy and I used to get together on Friday nights at her apartment, walk to the grocery store (Central Market), and pick up some delectable bites for dinner. Most of the time we ended up with a few types of salami (my favorite was the finocchiona! It’s made with ground fennel seed! ), some brie or some blue cheese, some nuts, fresh and/or dried fruit, garlic-marinated olives or kalamata olives, some wonderful bread from the bakery (Italian white was our favorite–coated in cornmeal and so delicious! ), and, of course, some wine. However, a few times we grabbed some of the ready made pizza crusts from the Central Market bakery. The crusts are about half-cooked, so you can top them with whatever you want, pop them in the oven, and have dinner in about 10-12 minutes. They have both personal size and full size crusts. We made margherita pizza (tomato, basil, and fresh mozzarella), salami/blue cheese/carmelized onion pizza, and probably others I can’t recall right now. I also used these crusts to make pizzas for an Election Night 2008 party. One was margherita, and the other was a basil pesto and shrimp pizza. As you can tell, I love these crusts! They freeze wonderfully, too. I had one in my freezer, and I made the following pizza with it a few weeks ago. 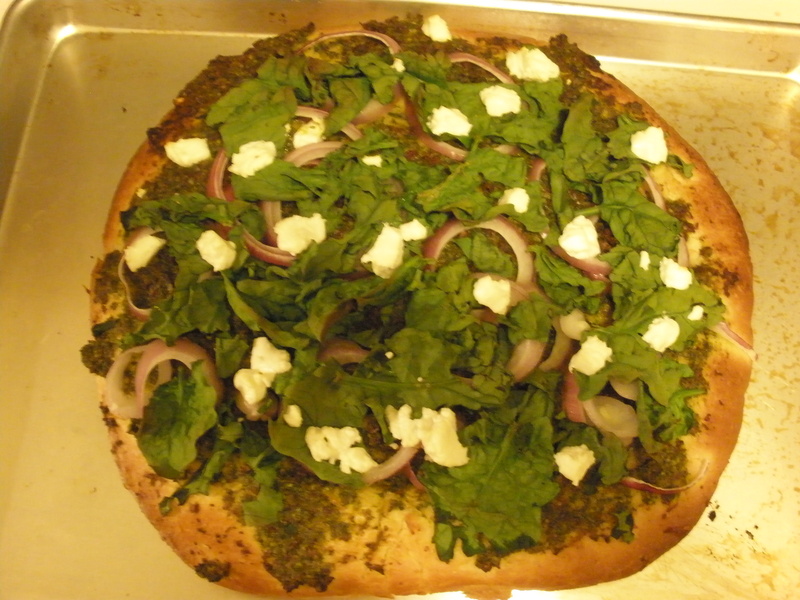 Preheat the oven to about 375 F.
Spread the pesto over the pizza crust, as if it were tomato sauce. Top with the spinach, the sliced onion, and the goat cheese. Bake for about 12 minutes, until the edges are brown. Today I’m featuring three different dishes which are all extremely easy, fast, and really hard to mess up. I spent a bit less than 30 minutes preparing this feast. The technique I show here for preparing the fish can be used with any kind of fish you want to cook this way, like tilapia or salmon. The advantages with this method are that the aluminum foil makes cleanup very easy, and your fish will not dry out. Fish will take 10 minutes to cook per inch of thickness, so if you cook salmon this way, sometimes the fillets are thicker than 1 inch and will require additional time. First, preheat the oven to 400 degrees. Use a cookie sheet or a glass baking pan and cover with enough aluminum foil to wrap the fish fillets. Rinse the fish, and place on the foil. Salt and pepper the fish, pour on some olive oil, and cover with the dill. Turn over a few times, using your hands to cover the fish with the oil, salt, pepper evenly. Then, cover the fish with the aluminum foil, as pictured below. It takes a while for the oven the heat to 400, so while you wait, prepare the couscous and chop the zucchini. Bring the water to a boil with about a 1/2 teaspoon of salt. When the water boils, stir in the couscous and the peas or edamame, and immediately take off the heat. Cover, and let sit for 5 minutes. If the oven is done heating, pop the fish in the oven and set a timer for 10 minutes. As the fish cooks, heat about 1-2 tablespoons of olive oil in a skillet over medium heat. Chop the zucchini. Once the skillet is hot, put the zucchini on, and sprinkle with some salt and pepper. You’ll want to stir the zucchini a few times as it cooks. It will take 5-10 minutes. By this point, your couscous will be done. Uncover, and stir in the spinach or arugula, along with the chopped sun dried tomatoes. Whenever your timer goes off, take the fish out of the oven and check to make sure it’s done. You may not be finished with the zucchini and couscous when the fish is done, but if not just let the fish sit wrapped in the foil until everything else is ready. To finish, I added a bit of parmesan cheese to the zucchini, and I squeezed some lime juice onto my fish.